Lawrence Hamnett Soccer Association and its advocacy of the national development movement to staying "small-sided longer"
Over the past few years, there has been a nationally-coordinated movement to alter the game “structure” of youth soccer competition by emphasizing short-sided games. The United States Soccer Federation (USSF) has strongly embraced the approach of ‘staying small-sided longer’ after studying its successful application in the top European clubs and national teams (e.g. Belgium, Spain, Holland, Germany) who emphasize the development of players over winning within their youth programs. "Small-Sided Games" consist of a format whereby fewer players compete on a smaller-sized field in an open format without the rigid constraints of positions. Consequently, these games involve more frequent touching of the ball for all players, greatly facilitating technical proficiency, creativity/improvisation, and fun. All ages can play "small-sided games", but its developmental impact is maximized for younger soccer players (U12 and younger). mandated short-sided fixtures for youth competition. 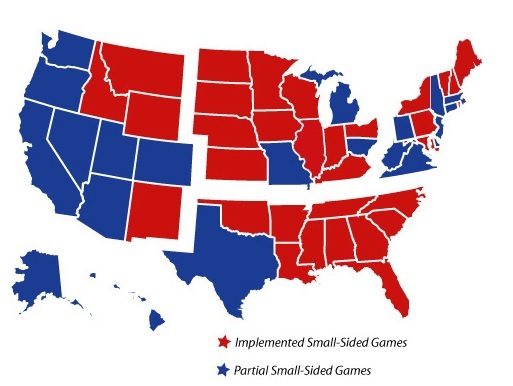 BLUE states are not yet in the mandatory stage, but have an increasing presence of clubs/leagues offering the option. *Reference: US Youth Soccer website, November 2013. Lawrence Hamnett Soccer Association (LHSA) has joined a legion of highly regarded New Jersey clubs including Player Development Academy (PDA), New Jersey Soccer Academy (NJSA), Parsippany Soccer Association, Greater Flemington Soccer Club, Jackson Soccer Association, Princeton Soccer Association, etc., all committed to the philosophy of staying ‘short-sided longer’ . There is mutual recognition it is the most effective and efficient way to foster and facilitate player development and to stimulate players’ collective enjoyment of the game.